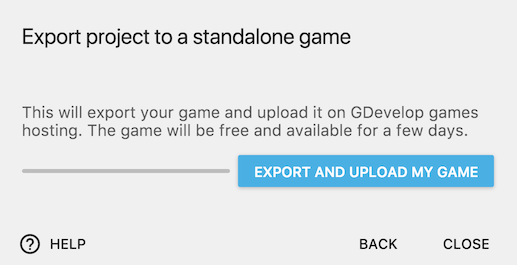 Using GDevelop hosting servers, you can export your game for publication on the web. . The hosting servers are free. Your game will be available for a few days! To upload to the servers, in the File menu, choose Export. Then choose Web (upload online) ,and then simply click on Export and upload my game. The game will be hosted on GDevelop hosting servers.These servers are backed by Amazon's robust services. The games that you upload are available to use to share your game for a few days. There is no charge for this service. Note that the link, by default, is private. It not shared anywhere. You can share the link to your game according to your needs. Share with a few people or a larger audience.